The Dilemma got some unwanted publicity when a joke in the film's trailer upset people with its crudeness. The film itself proved less noteworthy, with veteran director Ron Howard unable to build on past comic successes or the pairing of two very disparate comic souls. 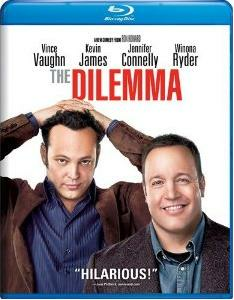 Vince Vaughn and Kevin James star as Ronnie and Nick, longtime buds and business partners on the verge of an epic deal. Before they can seal said deal Ronnie catches Nick's wife (a shrill Winona Ryder) locking lips with a stranger. The sight jars Ronnie, but he isn't sure what to do. Telling Nick means potentially sabotaging their delicate business transaction, one that could impact the rest of their lives. But how can he ignore such a betrayal, one that threatens a life-long bromance? Comic possibilities abound in The Dilemma, but big laughs never appear. The film teeters between the serious and the absurd, and Howard never feels secure enough to let one tone dominate. We're left with a mildly amusing comedy interrupted by dramatic flourishes, nothing more. The narrative could also use some tweaking. Some passages feel more like outtakes from a random Three's Company episode than a feature film. Vaughn and James look comfortable together on screen, but the screenplay never lets their budding chemistry connect. Channing Tatum does tweak his hunky image as the man making time with Nick's main squeeze. The Blu-ray extras include an alternate ending, deleted scenes, a gag reel and a featurette dubbed "This is The Dilemma." The gag reel is about as funny as the rest of the feature, which isn't much of a recommendation. But it does show the vibe Vaughn and James share, a hint that better comic collaborations could await them. And the film's Chicago tour segments offers a taste of the Windy City, including a personalized peek at The Green Mill, a city lounge brimming with rich mobster history. Mao's Last Dancer recalls a remarkable chapter in recent U.S.-Chinese relations, one that deserves a second cinematic look. It's a shame that celebrated director Bruce Beresford (Driving Miss Daisy) tells it via primary colors when shades of gray were clearly required. The film, available exclusively at Target, follows the journey of an 11-year-old boy plucked out of his modest classroom to train as a dancer for his country. Years later, Li Cunxin (Chi Cao) visits the U.S. as part of a traveling ballet tour only to find the propaganda fed to him about this capitalist country wholly inaccurate. Will he chose to stay in the U.S. by any means necessary, or is the pull of his homeland too strong to resist? Dancer unfolds with frequent flashbacks to Li's childhood, a time when the comforts of his peasant family were replaced by a strict dance academy setting. We also see the nonstop Mao worship he endured. The Communist leader's mug is everywhere, and it's even harder to escape the indoctrination all around him. The culture clash he faces in America involves far more than his internal contradictions. Chinese officials are none too keen on seeing their prized possession taken away, and even some of the U.S. dance officials who embraced him so readily at first don't want to see him leave China. Dancer short cuts too many subplots to be considered a great film, from the Li's quickie marriage to the family ties that somehow still bind after all those years. But it's still an arresting story, its strength lying in the contrast between a free society and one which expends so much energy controlling its citizens. The Blu-ray extras include a "making of" featurette letting the film's key players describe its origins. Beresford describes the movie as a "rags to riches" story, albeit one in which the rags were "extreme" given the main character's humble roots. The production attempted to shoot in the real Li's home village, but over time it was absorbed by a nearby city and no longer worked visually. So they turned to a village 100 kilometers outside of Beijing which fit the film's needs much better.